We are excited to announce that Orchard Hill Breadworks has chosen the Great River Co-op as the beneficiary for an upcoming Pizza Night Fundraiser on August 1st! Join us in East Alstead, under the Pizza Pavilion, as Great River Co-op Volunteers work alongside the folks at Orchard Hill Breadworks to bake mouthwatering pizzas to benefit the Co-op! Started in 2007, Pizza Night at Orchard Hill Breadworks runs 12 Tuesdays throughout the summer, from June 13th to August 30th. 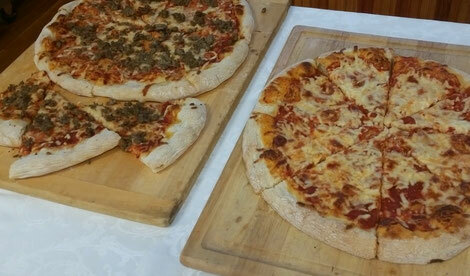 Orchard Hill Provides crusts (with gluten free crusts available,) sauce and cheese. Attendees bring their own toppings, or even pick them from the new Pizza Night garden! A different local group is beneficiary each week with 100% of the profits going to that night’s sponsored group. Pizza Night at Orchard Hill Breadworks is now a local summertime tradition, and we are so proud to be a part of the fun! We hope to see you there! Visit the Facebook event and click Going-and we'll see you there!